New! 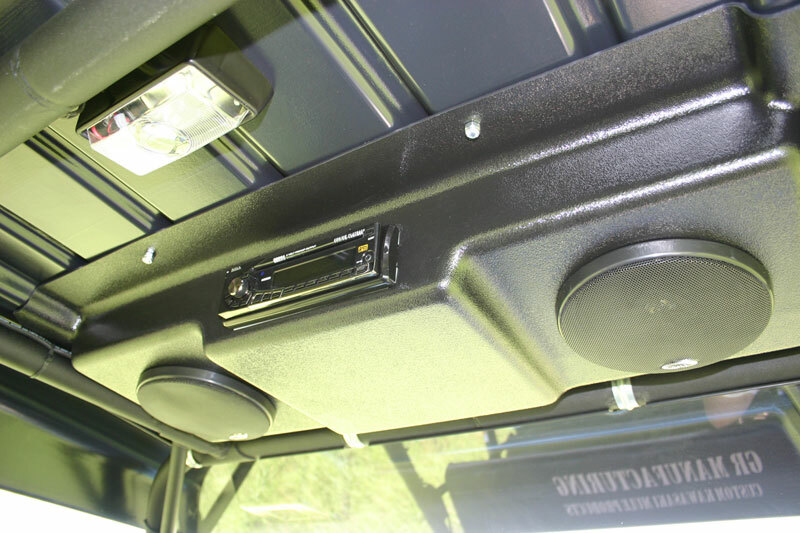 Custom stereo system, which mounts inside of GR Manufacturing hard tops! Computer-designed to perfectly mate inside of the GR Manufacturing hard top. No modification necessary. Mounts / installs in just a few minutes. Comes standard with a CD player (anti-skip/vibration head unit), AM/FM stereo, antenna, 6.5” speakers, removeable faceplate, wireless remote control, iPod and MP3 input, and all major wiring is done for you! Fully wired and tested before the unit is shipped to your dealership. This allows for a quick installation, without the need for your technician to spend hours wiring up a stereo unit! Typical installation time is only 4 or 5 minutes! Wiring harness is fully installed and seamlessly plugs into the Kawasaki factory wiring harness. 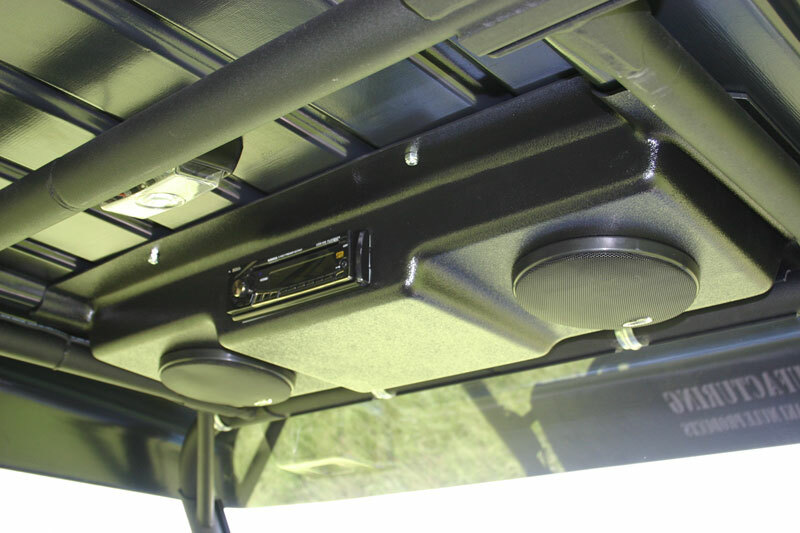 Wireless remote control allows for hands-free operation of the stereo, from the front seat or the back seat of a Trans Mule! Also comes with a plastic carrying case to store the faceplate of the head unit when the system is not in use. Full one-year warranty on the stereo head unit and speakers, directly from Boss, the manufacturer of the components! Hundreds of people inquired about a custom stereo system, and now we have the solution! This sound system produces very pleasing music, since the speakers are directed directly over the driver / passengers. iPods and MP3 players are extremely popular these days. Instantly plug your MP3 player into this unit and take all of your music along with you for the ride! Other stereo units are on the market, but they are typically 2-3 times more expensive than our unit! And some of our competitors make their product out of wood…..who wants a wooden stereo enclosure which can eventually rot if exposed to the elements? And, it is much more expensive than our unit! Our new stereo is simply the best version on the market. Make HUGE profits on every Trans Mule you sell, by also offering our new stereo system! We can show you how to double the normal profits you typically make when selling a Trans Mule. How? Add an affordable package of a GR Manufacturing stereo, hard top, and a windshield! Ask us about our special package price for all three components, which saves you a lot of money versus buying the products individually. In stock and ready to ship to you TODAY. Allow your customers to ROCK-and ROLL in their new Mules!